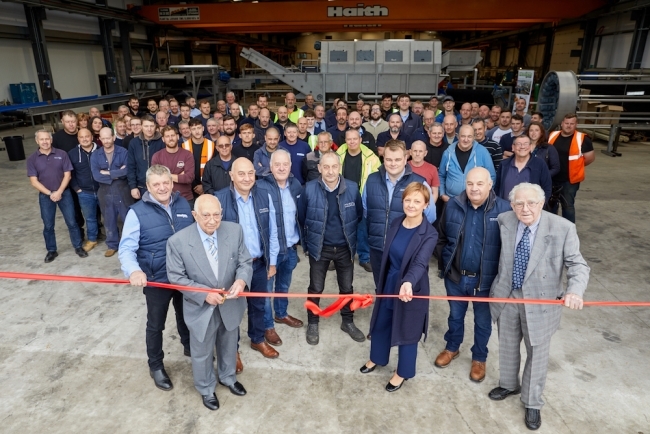 Specialist vegetable handling and processing machinery manufacturer Haith Group is preparing for growth following the opening of a new £1.5 million factory extension. The company which works with farmers, packers and food manufacturers has added an 870 square metre extension to its Doncaster site. The new building will allow Haith to work on multiple large-scale projects at the same time and provide much-needed space to assemble the company’s Rota-tip box tipper, Root Veg Polisher, barrel washers and box fillers, for which Haith is enjoying unprecedented demand. Taking just 13 weeks to build, the new factory was officially opened on 21st September by Haith Group founder, 92-year-old Mr Geoff Haith, in the presence of the company’s 110 employees, which includes his five sons and daughter. As well as extending the factory, Haith has also recently taken on ten new employees, including project managers, designers, fitters and site service and installation engineers. The new factory, which was designed and built by Robinson Structures, the same company that built Haith’s original facilities, features a £750,000 fibre optic laser cutter, a five-ton overhead crane and a range of environmentally-sensitive features, such as LED lighting and the highest levels of insulation. Incorporated as a limited company in 1964, Tickhill Engineering, which trades as Haith, is one of the UK’s leading designers and manufacturers of vegetable handling equipment. Its range of grading, washing, bulk handling, weighing, pre-pack systems and water treatment solutions are relied upon by some of the world’s largest food producers and packing companies along with farmers of all sizes in the UK and overseas.